Metaphor Alert: Democrats might as well get used to it … Obama sand sculpture washed away. Talk about creepy. Who actually thought this was a good idea? It’s bad enough this sand Obama makes the presumption of a Mount Rushmore type sculpture, but damn, this creepy thing looks more like Jabba the Hut. Barack Obama is going to have more to worry about than getting washed away by bad weather in NC, losing North Carolina in the 2012 Presidential election for starters. A torrential downpour that struck Charlotte Saturday afternoon damaged the Mount Rushmore-style sand sculpture bust of President Obama — an ominous beginning to what many fear is a plagued convention. From the Lonely Conservative, the Obama sand sculpture might be better put to use as a kitty litter box. HAHAHA. More biting sarcasm from Ricochet. Priceless. Unfortunately, as every child who’s spent a day at the beach well knows, sand castles–or cult-of-personality-worthy sand statues–aren’t known for their water resistance. And it rains during the summertime in North Carolina. Sometimes a lot. Hey isn’t that ‘No-JOBas the Putz’ ? #2…Kitty litter would be a great use…it’s ugly and eery …put a garden in it’s mouth and break down the sand!!!!! simply eroding away by the laws of Nature. SM: Let’s hope so. America does need a cleansing after this bunch, Obama, Reid, Pelosi, Wasserman Schultz being in power. Barry really wants his face on Mr. Rushmore, but it takes years of work to make that happen. Your last sentence says it all. Temporary edifices to tin despots are soon washed away in an instant of time. Hmmm; according to The Charlotte Observer (goo.gl/ICjsu), the WA-Times article might not have been, how should one say, true! BTW, when you asked: “Who actually thought this was a good idea?”, the linked article had an answer for that as well: “the Myrtle Beach Convention and Visitors Bureau, which commissioned the sculpture”. I imagine there is no ill will towards promoting tourism, which I expect is an important part of the local economy. SM: where are the environmental whackos going nuts over the taking of sand from the beaches? Can you imagine if Romney had done this? 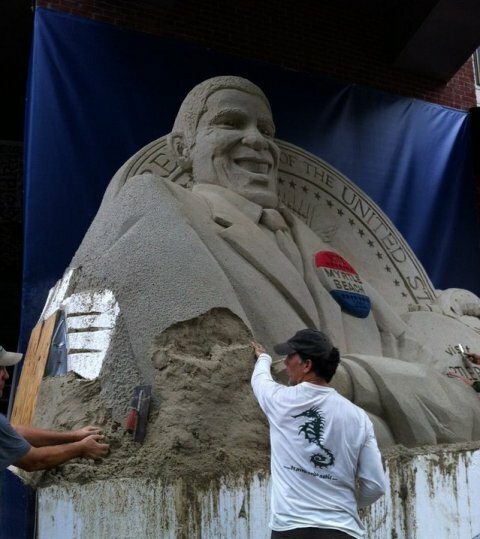 Also, just too funny that Obama would carve a likeness out of sand … up next is the Obama House of Cards economic agenda. Are you saying Obama is in charge of the Myrtle Beach Convention and Visitors Bureau? What are you trying to pick them? BTW, Whoever really thinks this is a Mount Rushmore-style sculpture is a moron. Please, any one who would say,”we are the one’s that we have been waiting for” is arrogant enough to think that his mug should be on Mount Rushmore. However, there is a complication. There is not enough rock left there for his ears. Or his ego. Obama on Mount Rushmore. You are right. Anyone would have to be a fool to think BO could ever earn a spot among real presidents. “I am saying that this is a stupid idea. But then again, I forget who I am talking about.” – I would presume you are talking about the artist(s) who sculpted the sand, and who hired them. Who else is there? I just don’t get why anyone would pick on them even if their idea was stupid? It’s just a pile of sand. ” ”we are the one’s that we have been waiting for” ” – I don’t find this quote in this particular story. How does this relate to those involved in the sand project? “Obama on Mount Rushmore . . . ” – You are (presumably) referring to a historical perspective, and, IMO, to the impossibility of changing a completed work of art. I’m referring to artistic design and aesthetics. SM: The stupid idea is not that of the artist … hell, artists today think that a Crucifix in urine or the Virgin Mary in human waste is considered art. These folks will do anything. The idiots I am referring to is TEAM OBAMA who approve all of this stuff, sit around a table and say, eureka … WHAT A GREAT IDEA. Let’s have a creepy likeness of Obama made of sand. Don’t worry, no one will make the apology of of fleeting Obama is made of sand that he can be damaged by the weather. Then again the Obama Presidency has done nothing but shovel sand against the tide ,,, in others words, FUTILE. Like I said earlier, they would have been better using the medium of “welfare” cheese to sculpt Obama’s likeness. Well, I know of no connection to team Obama with the sculpture, and I’ve seen no reporting of anything like that. Unless I see evidence of a connection, I’ll stick with what info is available and not invent a narrative to support a particular agenda. SM; Of course you will because you drink the Kool-aid. How in the hell do you think anyone could get approval to get that much beach sand. You think its given to an individual for the hell of it? Really? Seriously, exactly how old are you? I feel like I am talking to a 12 year old. Use some common sense. Do you always believe what you read and are told? As far as the sand question; I don’t know. and that is OK. I don’t need to consider unfounded theories to fill a hole in knowledge. To me, a lack of information is not necessarily a good reason to imagine what might be the case. It seems to me that your personal comments are purely frustration, and I have no idea what value they have in discussing this or any another topic. As conjecture, they don’t say anything about me, so I suppose they must mean something else.